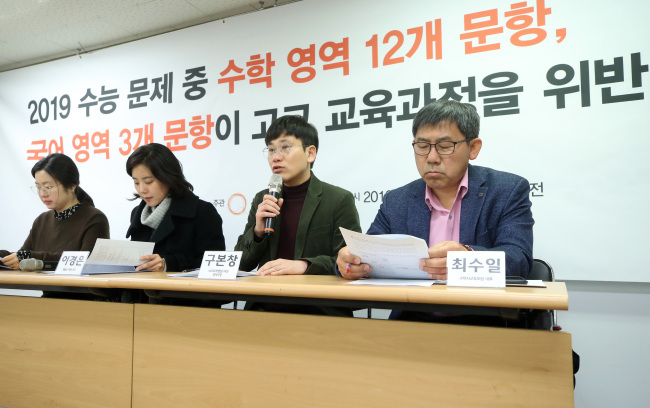 Parents and students have filed a lawsuit against the Korea Institute of Curriculum and Evaluation, claiming some questions from the 2019 college scholastic ability test, or Suneung, were beyond the level of high school. A civic education group held a press conference Wednesday asserting that some questions from the 2019 Suneung were taken from outside the national curriculum, making it more difficult for students who did not attend cram schools or receive private tutoring and instead relying solely on their school education. The organization submitted its written complaint condemning the government for inducing excessive private education and revealed that 10 test-takers and their parents had filed a lawsuit against KICE for damages. According to the Special Act on the Promotion of Public Education Normalization and Regulation on Precurriculum Education, questions beyond the scope and level of the national high school curriculum cannot be included on Suneung. KICE previously provided evidence that all of the 2019 Suneung questions were from the national curriculum. The civic group that conducted independent research with a team of 10 education professionals, however, concluded that 15 of the 105 questions were from outside the national curriculum. For example, question No. 42 in the national language section was of the level of difficulty found in the Legal Education Eligibility Test, a professional law school admissions test, and Public Service Aptitude Test. In response to the allegations, the Ministry of Education is planning to review the written complaint.